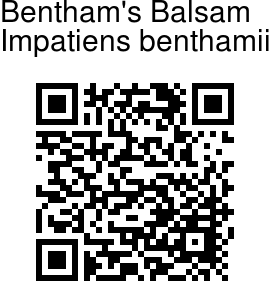 Bentham's Balsam is a	beautiful balsam species, which is named for George Bentham, 19th century English botanical author. Flowers are nearly 2.5 cm across and as deep, purple ; sepals very variable, ovate or lanceshaped, straight or sickle shaped ; standard with a dorsal conical blunt horn or swelling; wings 2-lobed ; lip pouch-like, longer than broad ; spur short, incurved. Flower-cluster-stalks are slender, shorter than the leaves, with as many lanceshaped bracteoles as there are flower-stalks. Flower-cluster-stalks horizontal, with 1-4 large flowers. Stems are square in cross-section, 1-1.5 ft tall, more or less crisply hairy on the stem and leaves above, rarely hairless. Leaves are 2.5-7.5 cm long, opposite, nearly stalkless, stipulate lanceshaped tapering sawtoothed. sometimes ovate- or oblong-lanceshaped, teeth often fringed with hairs, pale beneath. Capsules are 1.8 cm, hairless, ellipsoid, turgid in the middle. Seeds oblong, compressed ; testa pale, membranous. 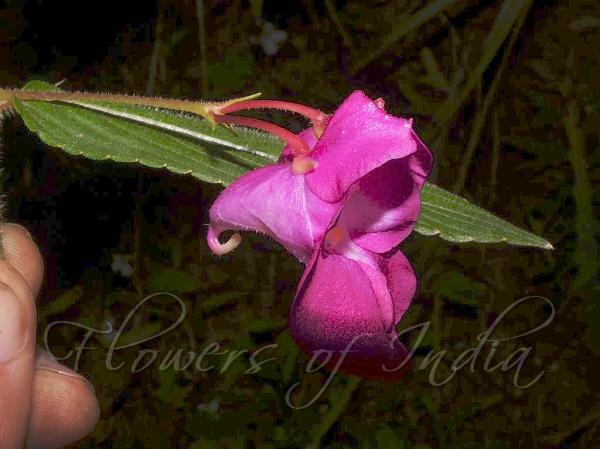 Bentham's Balsam is found in Eastern Himalayas, in Khasi hills, at altitudes of 1300-2000 m.
Identification credit: Rajib Gogoi Photographed in Meghalaya.